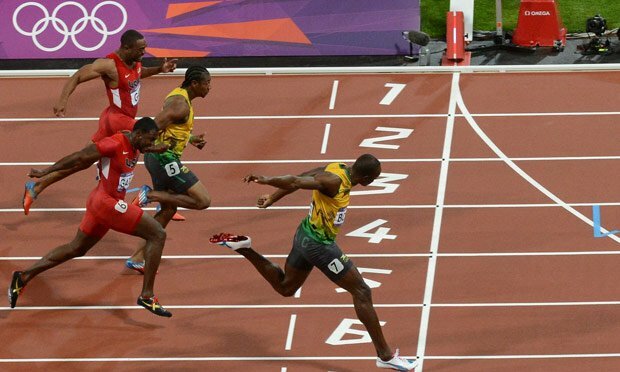 Usain Bolt’s extraordinary speed has been explained by scientists with a mathematical model. Usain Bolt’s 100 m time of 9.58 seconds during the 2009 World Championships in Berlin is the current world record. The scientists say their model explains the power and energy he had to expend to overcome drag caused by air resistance, made stronger by his frame of 6ft 5in. Writing in the European Journal of Physics, the scientists hope to discover what makes extraordinary athletes so fast. According to the mathematical model proposed, Usain Bolt’s time of 9.58 seconds in Berlin was achieved by reaching a speed of 12.2 metres per second, equivalent to about 27 mph. The team calculated that Usain Bolt’s maximum power occurred when he was less than one second into the race and was only at half his maximum speed. This demonstrates the near immediate effect of drag, which is where air resistance slows moving objects. They also discovered less than 8% of the energy his muscles produced was used for motion, with the rest absorbed by drag. When comparing Usain Bolt’s body mass, the altitude of the track and the air temperature, they found out that his drag coefficient – which is a measure of the drag per unit area of mass – was actually less aerodynamic than that of the average man. Jorge Hernandez of the National Autonomous University of Mexico said: “Our calculated drag coefficient highlights the outstanding ability of Bolt. He has been able to break several records despite not being as aerodynamic as a human can be. “The enormous amount of work that Bolt developed in 2009, and the amount that was absorbed by drag, is truly extraordinary. “It is so hard to break records nowadays, even by hundredths of a second, as the runners must act very powerfully against a tremendous force which increases massively with each bit of additional speed they are able to develop. “This is all because of the ‘physical barrier’ imposed by the conditions on Earth. Of course, if Bolt were to run on a planet with a much less dense atmosphere, he could achieve records of fantastic proportions. “If more data become available in the future, it would be interesting to see what distinguishes one athlete from another,” added Jorge Hernandez. Usain Bolt’s time in Berlin was the biggest increase in the record since electronic timing was introduced in 1968. John Barrow at Cambridge University who has previously analyzed how Usain Bolt could become even faster, explained that his speed came in part due his “extraordinary large stride length”, despite having such an initial slow reaction time to the starting gun. John Barrow said Usain Bolt has lots of scope to break his record if he responded faster at the start, ran with a slightly stronger tail-wind and at a higher altitude, where there was less drag. Usain Bolt’s Berlin record was won with a tail wind of only 0.9 m per second, which didn’t give him “the advantage of helpful wind assistance”, John Barrow added.